Fashion trends have never been so daring, so rich in colour and texture. Simply looking back on the past five years, there has been a shift from the simple V-neck to a mix and match of loud patterns — a craze that seems to be sticking. It comes as no surprise that as the garments get louder, so do the accessories. Luxury jewelry is no longer limited to shiny metals and precious stones; the value of a piece is based on its uniqueness rather than its simplicity, making space for creative minds like Charlotte Hosten and her signature fabric necklaces. The young Belgian-born designer moved to Montreal when she was 10, and although she has travelled back and forth between two countries, she officially planted roots here when she opened up shop in November 2011. “I always wanted to build a little house around my necklaces,” she said. After visiting her boutique and dazzling over her collections, there’s no denying Hosten was meant to be an accessories and jewelry designer. She may have a law degree, but her need to express her creativity became a priority. Hosten began designing jewelry at the age of 15, a hobby that, with time, evolved into a passion. Once she graduated from university, Hosten began working for jewelry designer Renée Lévesque, where she had access to various materials and was given the opportunity to create her own designs. It was only in 2008, by pure serendipity, when Hosten discovered where her talents lay and how a small piece of fabric could bring a personal and distinguishable touch. Hosten explains that she’s never able to pinpoint exactly what inspires her. She keeps her eyes open and embraces everything that comes her way, from art, to fashion, to interior design. 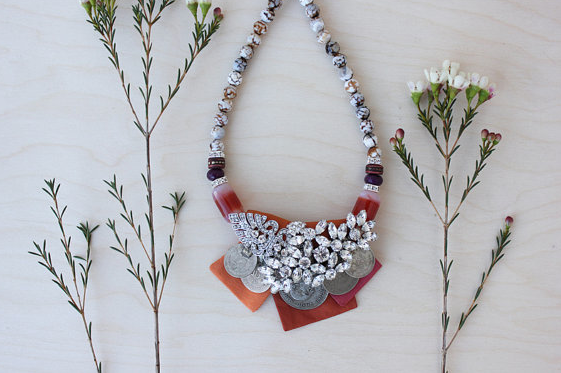 Her spring/summer 2013 collection, Bombay Bazar, is a reflection of her voyage to India — a trip that introduced new materials to some of her favourite pieces, such as the Lakshmi necklace. Her designs are one-of-kind and sometimes custom-made, a feature that seems to attract brides-to-be. With such a demand, Hosten incorporated a bridal collection a year and is currently working on her next collection. Whether it be pearls from decades past or a sentimental trinket, Hosten tries to incorporate a dash of vintage to every design. Just in the past year, her statement pieces have graced the pages of fashion magazines like Flare, ELLE, FASHION and Chatelaine. Atelier Boutique is located on 122 Bernard W. St.
Impact scarves: fashion or passion?